For nearly two decades Griot Galaxy was at the vanguard of the Detroit Music scene. Members of the band performed and recorded with Roscoe Mitchell, Sun Ra, Abdullah Ibrahim and Phil Cohran. The fact that there were only two releases of the band under their own name during this period seems criminal. Entropy Stereo is pleased to present this complete concert performance at the Detroit Institute of Arts from 1983. 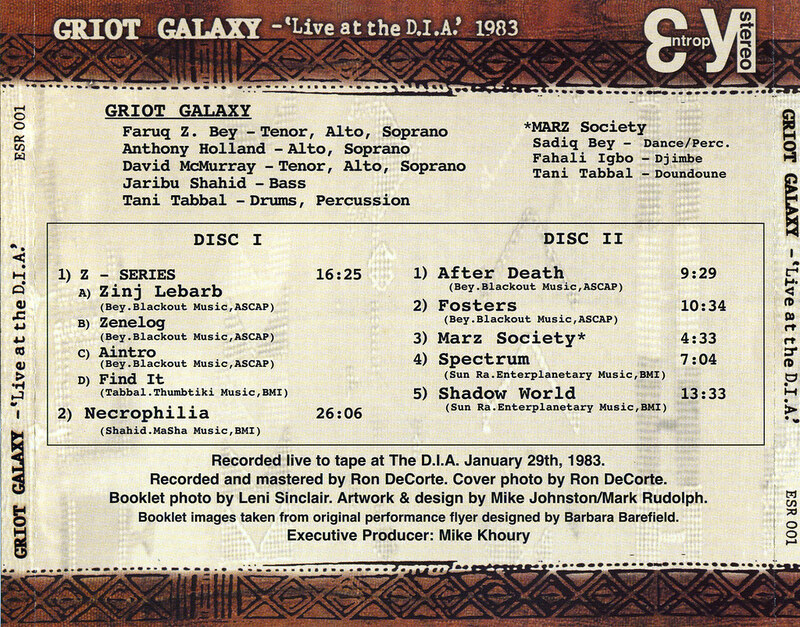 Beautifully recorded, this is Griot Galaxy at their peak. 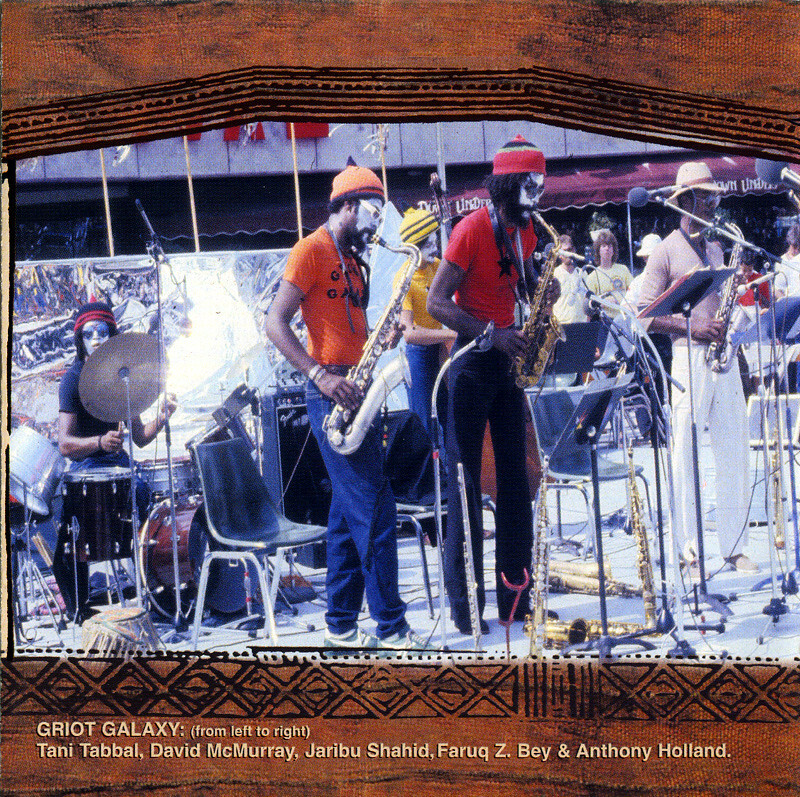 Griot Galaxy was Faruq Z. Bey, Tani Tabbal, Jaribu Shahid, Tony Holland and David McMurray. Detroit has a history of being a city with uncompromising appreciation for the creation and presentation of music. Audiences were frequently exposed to some of the greatest artists of the century, which culminated in the late 60s with the music of John Coltrane, Sun Ra, and the Art Ensemble of Chicago. In the 70s there were few places where the Sun Ra Arkestra could pack a screaming auditorium with as highly a perceptive an audience as in Detroit. From these fertile grounds Griot Galaxy was born. Detroit native saxophonist Faruq Z. Bey founded Griot in 1972. Faruq’s sound is reminiscent of Pharoah Sanders while his phrasing bows to John Gilmore and John Coltrane. Drummer Tani Tabbal, came to Detroit from Chicago where he had worked with Sun Ra and trumpeter Phil Cohran’s Artistic Heritage Ensemble. Tani brought to Griot his sophisticated, swinging, polyrhythmic style and worked comfortably with the odd meters in which the band frequently played. Jaribu Shahid, another native of Detroit, settled in as bassist for Griot. He shared his strong tone and elastic rhythmic sense and formed a lasting association with Tani. Anthony Holland, one of the co-founders of the Michigan organization, The Creative Arts Collective, gave Griot his clean precision on a variety of horns. Saxophonist David McMurray contributed his intense tonal power and diversity to the ensemble after having worked with Albert King, Was Not Was, and Funkadelic. The quintet on this disc is the working line-up of the band that locked in after its evolution through the 70s. Today the former members of Griot Galaxy are still on innovative paths and each continues to create music at a very high level. The band performed in Michigan on a regular basis and was a vital component of the creative music scene in Detroit for almost two decades. As part of an essential hub of musicians, Griot interacted with members of The Creative Arts Collective. In a series of concerts at the Detroit Institute of Arts (DIA), members performed with players from other regions of the country. Guest musicians included Abdullah Ibrahim, Anthony Braxton, Sun Ra, Randy Westpn, and Roscoe Mitchell. These noted musicians also collaborated with a few of Griot’s members for other recording projects and performances. Some Griot members had their first opportunity to record in 1976, performing on a tune for Phil Ranelin’s “Vibes From the Tribe” LP. With this release, many music enthusiasts recognized the birth of a fresh voice in creative music. Then in 1981, the album “Kins” was released on a small, newly created Detroit label called Black and White run by recording engineer Ron DeCorte. The album became an instant classic. Unfortunately, due to a series of mishaps, many of the copies pressed were lost to the city dump. These events not only made the album scarce, but also limited Griot’s exposure to a wider audience. In 1983, a couple of Griot’s tunes were included on an obscure release called “Motor City Modernists” from a performance recorded at the Detroit Montreux Festival. Later in 1984, Griot played a number of European festivals at which time a live concert of the group was recorded in Austria. The album resulting from this performance, “Opus Krampus”, on the German label, Sound Aspects, captured the live sound of the band better than any previous recording had. The release brought Griot some of the international recognition, which had eluded them. Even though concerts and recording projects continued, nothing more was ever released of this legendary Michigan ensemble. In 1989, Faruq was involved in a serious motorcycle accident, which ultimately led to the demise of the group. 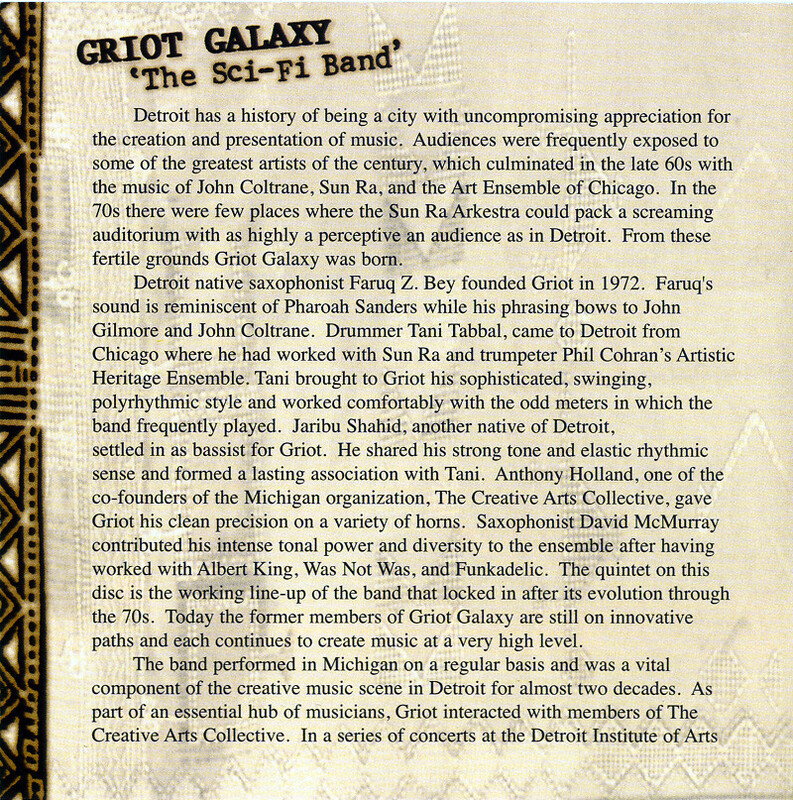 Griot was influenced by the ideas of members of the Association for the Advancement of Creative Musicians (AACM) and Sun Ra, yet they maintained their own unique vision of creative music. Although the ensemble arranged its music largely as a collective, one of the primary elements of Griot’s distinct sound stemmed from the writing of saxophonist/poet Faruq Z. Bey. Faruq’s tunes weave complex and intricate lines often played in odd driving meters. His use of developed harmonies sound organic and alive. Much of the music’s quality reflects his study of language, speech, and vocal intervals. The music Griot offers on one level sounds direct and raw, and on another it stirs and opens subtle d in the unconscious mind. 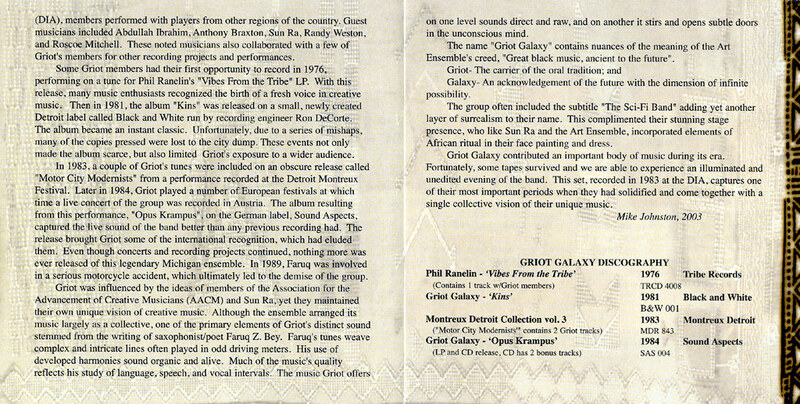 The name “Griot Galaxy” contains nuances of the meaning of the Art Ensemble’s creed, “Great black music, ancient to the future”. Griot- The carrier of the oral tradition; and Galaxy- An acknowledgement of the future with the dimension of infinite possibility. The group often included the subtitle “The Sci-Fi Band” adding yet another layer of surrealism to their name. This complimented their stunning stage presence, who like Sun Ra and the Art Ensemble, incorporated elements of African ritual in their face painting and dress. “Griot”: A story teller and keeper of the faith. “Galaxy”: The universal truth. I first met Faruq Z. Bey in the late 70’s during his time as a host at WDET. The music he aired challenged me as a member of the human experience. 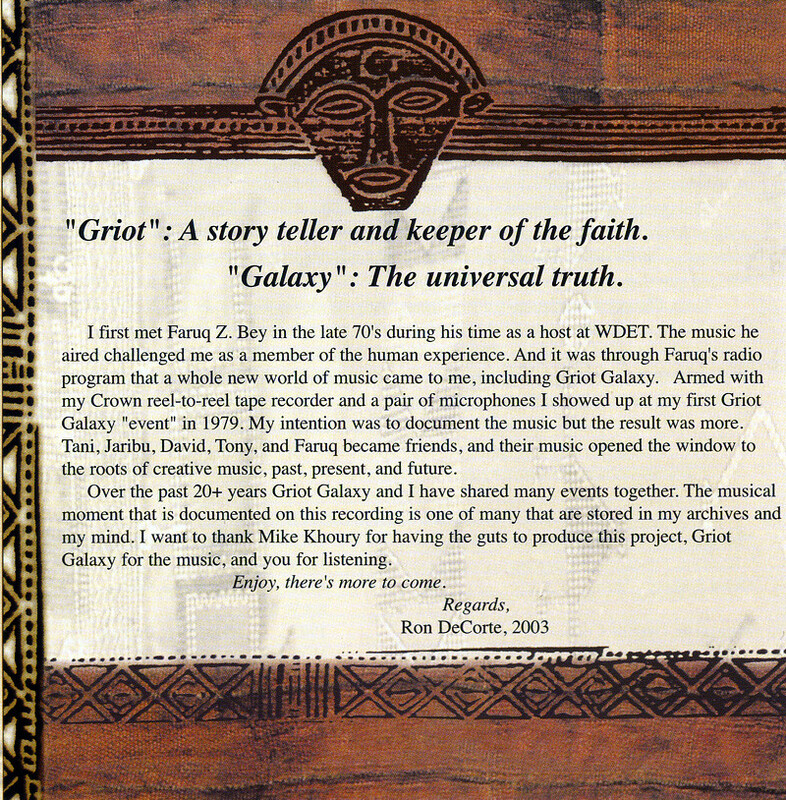 And it was through Faruq’s radio program that a whole new world of music came to me, including Griot Galaxy. Armed with my Crown reel-to-reel tape recorder and a pair of microphones I showed up at my first Griot Galaxy “event” in 1979. My intention was to document the music but the result was more. Tani, Jaribu, David, Tony, and Faruq became friends, and their music opened the window to the roots of creative music, past, present, and future. Tagged Griot Galaxy, Live at the D.I.A.